The President's challenge for June will be something turned not of wood. Symposium volunteer lists are up online: Link Signup now. More below. It is upon us, as it is coming next weekend, June 8th. Will put up online galleries for members if requested. Only 1 request. Email me some pics of your work, and I can put it online. I have not had any requests yet. Pics (from James) are at this Link. 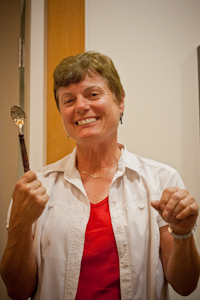 The meeting was a talk given by Bonnie Glover on kitchen utensils and how to sell at craft shows. It was quite entertaining, and we send out thanks to Bonnie for a very fine presentation. 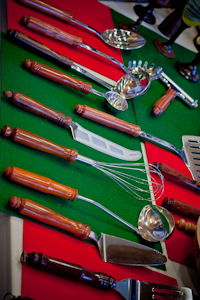 She turns a wide range of items: from salad tongs to spoons to cheese cutters, goblets, needle cases, etc. She also uses NorPro as a parts supplier. Making use of the various pieces of wood and the metal utensils found in many places - is something that delights. Her finish of choice is CA glue, using 100-250rpm and a cosmetic pad to apply. Several coats and micro-mesh to complete the finish. Wine corks and golf balls with finials are among the items she sells. President's Challenge: See this page for full pics. 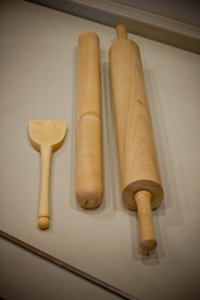 Harvey Klein had perhaps the largest thing he has turned, and he regaled us with tales of rolling pins. And a salt and pepper mills. Winslow had some nifty scoops. James turned a wood handle for a long BBQ skew which made Pat recoil in anticipation. 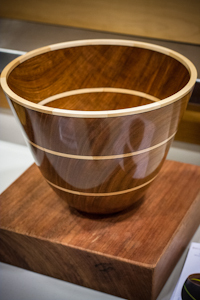 Gene Frantz had a nice walnut bowl with inlaid stone. 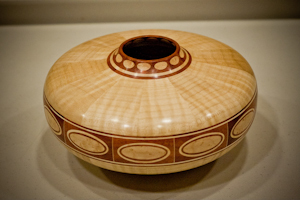 Barry had a piece made of corian, a lidded box, telling us that it does turn nicely and sands with fine sandpaper. Curtis had a clear acrylic lidded jar perhaps it is called. Not easy to keep clear no doubt. He used micromesh. Eric had a spoon as well. Tom (the new Tom) had a segmented piece with ovals turned on his computer controlled machine (pic at left). Joe Davis told the tale of the nearly burned down workshop. Richard had some tops for Peter. Louie had quite the collection of kaleidoscopes as he did last month. Nice work. 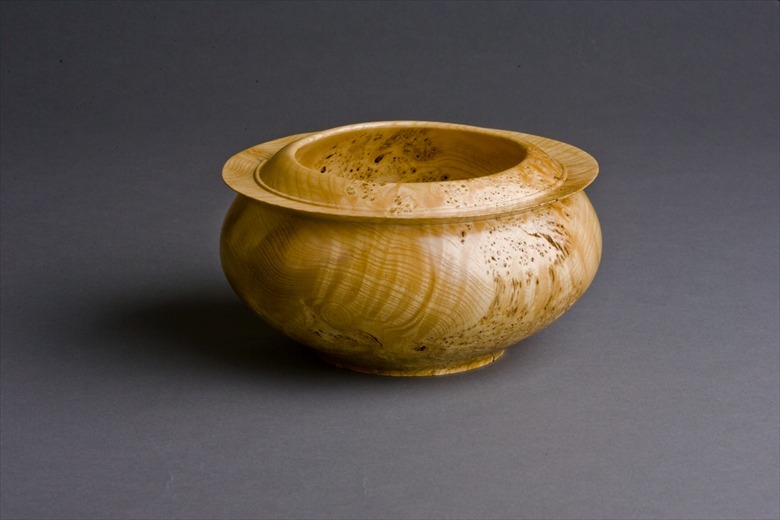 Tom Haines had a burl wine coaster and tells the tale of the continued use of the root ball. 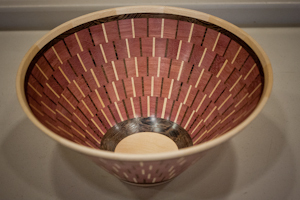 Gordon (the new Gordon, segmented as he is) displayed a very nice segmented bowl from the use of a board of wood. Pic at right. Wood is wenge, maple, and purple heart. James had 2 pieces, bowls that were nicely done. 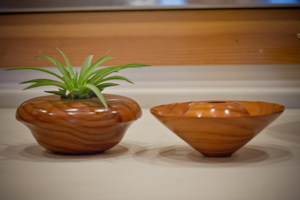 Ed Howes had 2 redwood burl pieces. And yours truly had a walnut burl bowl. The list of volunteer jobs are online: Link Do check it out now and let David know. Early June, only 1 week away, we will have the annual AAW Symposium in San Jose. A good percentage of club members are members of the AAW and have been to this symposium. This area will be used for lists and some communication. Assume that Yahoo groups will continue for email. I have placed the member list link on this page. I have placed a comment section there and can add other pages on specific topics that members can add comments to. 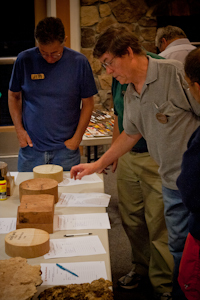 The wood auction was quite enthusiastically done, even thought Sydney was there. There is a trip to Las Vegas planned for later in the summer based on Sydney being able to place bets for those attending. Thanks to Laura, Barry, and Starry for the wood in the auction. Eric of Woodcraft collected a few dishes for candy to be contributed. Laura spoke about the demos by Jimmy Clewes (still hopefully being rescheduled for the Fall). A question of gaining feedback on demonstration was raised and acknowledged. 2 Bylaws were passed: AAW membership for officers required, and a proration for dues for members who join after the middle of the year. 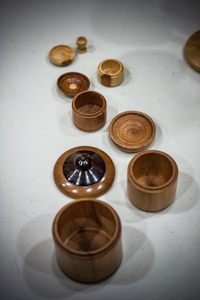 She also announced that the Club was awarded a grant for a demo lathe, so that is in motion.